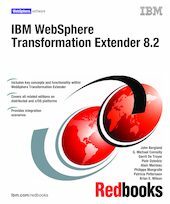 This IBM® Redbooks® publication provides an introduction to IBM WebSphere® Transformation Extender V8.2. WebSphere Transformation Extender is a powerful, transaction-oriented universal data transformation and validation solution. It offers multiple execution options to support right-time, right-style transformation, whether it is batch, real-time, or embedded. In this Redbooks publication, we present an overview of the WebSphere Transformation Extender products and components and discuss key features for businesses. We describe both the development and runtime or management aspects of the product and review troubleshooting capabilities. This book is written for developers, architects, and IT decision makers who desire a thorough understanding of the various editions and features of WebSphere Transformation Extender. In this book, we discuss the WebSphere Transformation Extender role in a service-oriented architecture (SOA) working with other components of the IBM Software portfolio, both on distributed platforms and on the IBM System z® platform. We include hands-on scenarios that show the end-to-end process to create, deploy, and execute WebSphere Transformation Extender. They show how WebSphere Transformation Extender works with IBM WebSphere Enterprise Service Bus (ESB) and WebSphere Message Broker, as well as on the IBM z/OS® environment. This information can help you to understand the product framework as you get started.